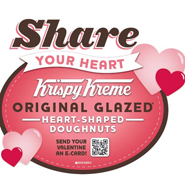 This Valentine's Day time, doughnut chain, Krispy Creme, is offering heart-shaped doughnuts. On the box there is a QR Code which when scanned lets the user send a Valentine eCard to someone. This is the second time Krispy Kreme has used QR codes. It has also used them for in-store promotions such as Dozen Days of Doughnuts, Krispy Skremes and the launch of the Hot Light app.